The Philippine Academy of Rehabilitation Medicine (PARM) has been leading the annual PARM Move Manila, a special event for persons with disabilities. This year, they broke out of the mold and organized the PARM Move Fitness, which aims to promote fitness for PWDs. The wellness event was held at Quezon City Hall last 20 July 2014 and was attended by hundreds of participants. Autism Society Philippines was represented by ASP President, Jan Peña and her son, Muneer, ASP Trustee Fortunato Agbayani; and the leaders and members of ASP Quezon City chapters. It was a fun-filled fitness event, that saw persons with autism having a fun workout and bonding with their parents. “Our bonding as mom and son was more significant because we were also bonding with our ka-sectors, celebrating the triumphs of 36th NDPR,” says Tita Jan. It was also an opportunity for Muneer to adapt to a new experience and a new environment. They enjoyed the physical workouts as she guided Muneer in following directions and movements and he enjoys being able to comply because it challenges his comprehension skills. He managed pretty well in being a part of a big crowd that is striving to move in unison. 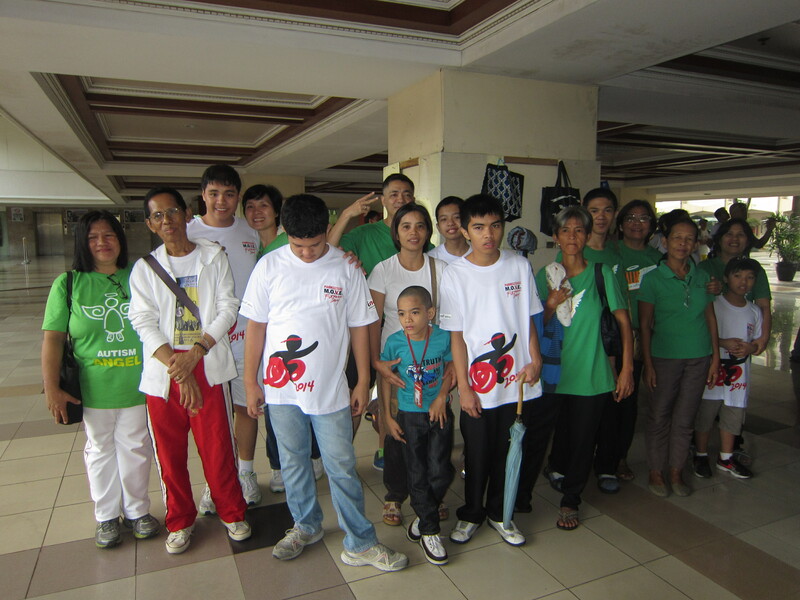 After the fitness program, the Holy Mass for PWDs was held, with ASP Tandang Sora Chapter as the lead group. Fr. Ronnie Banaria reflecting on the Gospel, comparing PWDs to the good seeds planted by the Lord. PWDs do not have the chance to turn their back against God but instead call and praise God more often. They are far from committing sins. He felt blessed to witness the PWD lectors, readers, choir and participants announcing the Word of the Lord with all faith and sincerity, conscious not of themselves; but of proclaiming the Good News as clearly and as effectively as they can. “PWDs are able to work producing pride in the community where we the unexpected comes out. Whereas the abled persons, where much is expected, builds and works with more anomalies and of low quality,” Ciony Torralba, Tandang Sora Chapter president, said. Jan Pena also said that she believes that God was greatly glorified in this gathering of sector believers, persons with different physical and intellectual conditions, yet one in spirit in worshipping God, the Creator of diverse human beings, Giver of rights equal among all.